Kafe Qian Shui Wan is a coffee shop in Teluk Intan, Perak, selling all kinds of street food and noodles. Our top picks there are always satay, grilled fish and popiah salad. Satay there is especially famous, and the owner’s wife is managing another satay stall around Pekan Baru. Though the satay meat is not as substantial as Kajang satay but it is not short of flavour, and decent enough to fill our craving for satay everytime we back to this small town. There is chicken, beef, lamb and rabbit meat satay to choose from, but we mostly go for only chicken. After the order, it always take some time for the satay to reach, for the owner is very particular on the grilling process. Though customers are queuing , the owner takes the time and carefully grilled every stick of satay, making sure that each and every stick is perfectly grilled with just a lightly charred surface. 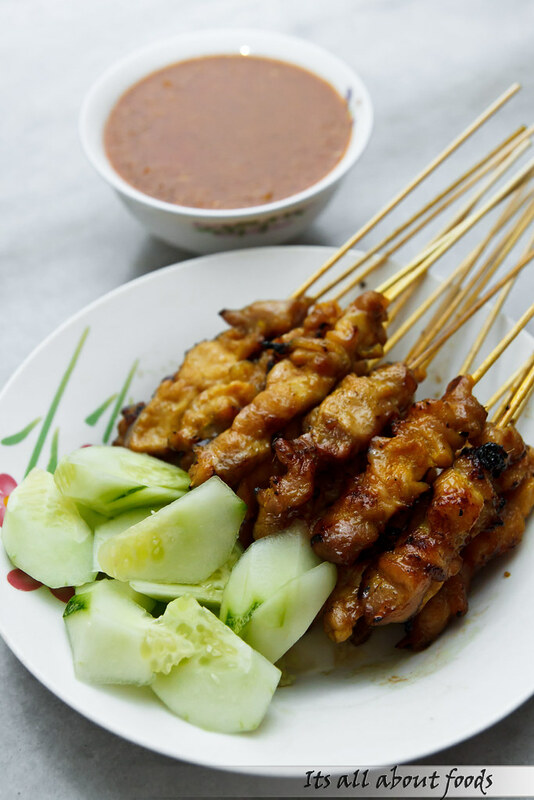 The satay is aromatic, juicy, meaty, and comes with a layer of aromatic chicken fat. The satay tastes good by eating it alone, but goes well with the creamy, nutty and spicy satay sauce too.